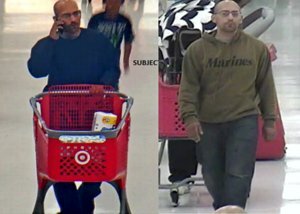 Police are hoping to identify a man caught on surveillance video committing theft at more than 30 Target stores throughout three Southern California counties, authorities said Monday. The man is accused of stealing approximately $25,000 worth of merchandise in the form of Dyson and iRobot vacuums and Nest products such as thermostats and smoke detectors, according to Detective Joseph Hampton with the Los Angeles Police Department. He’s targeted locations in Ventura, San Bernardino and Los Angeles counties, Hampton said. In one surveillance video from a location in North Hollywood, the suspect is seen with his cart full of items, which he covered with a blanket or mat. He stops near an emergency exit, ditches the covering and makes off with merchandise while activating the alarm. He always parks his vehicle near the emergency exit to ensure a clean escape, and sometimes uses a getaway driver, Hampton said. He could be offloading the stolen products through any number of means, including online second-hand retailers, swap meets or direct deals, according to the detective. Police describe the suspect as a white, Hispanic or Armenian man between 25 and 30 years old. He measures about 5 feet 7 inches to 5 feet 10 inches tall and weighs around 160 to 180 pounds. He has a shaved head and goatee and wears glasses, surveillance images show. The thief drives a black, four-door Cadillac SRX that is a newer model of the SUV. The vehicle does not have plates, officials said. Anyone with information can contact Detective Hampton at 818-754-8381 or 818-754-8377. Anonymous tips may be submitted via 800-222-8477 or LACrimeStoppers.org.